Saving money is hard. Kids, food, gadgets and any number of expensive habits all vie for that extra money you may have in your account throughout the month. It’s difficult to make a conscious effort to take that hard-earned money and save it for a rainy day. It’s even harder if you possess little self-control (my “vices” include exploring the world of whiskies and scotches, and an ever-expanding collection of baseball cards). From my experience, the best way to set aside money each month is to take the decision completely out of your hands. From scheduled transfers between accounts to convenient apps that save for you, automation can help you save money without thinking about it. Here are some of the best ways to automate your savings. Being a techy, this has been my favorite way to save. Here are a few tools that make saving automatic. Acorns is an app that rounds up your purchases to the nearest dollar, then puts the “spare change” in an investment account. You almost don’t notice it happening. Choose from aggressive, moderate or conservative preset “funds” for your investments. I’ve had my Acorns account for a few months now and have accumulated more than $200 in savings without really noticing. The returns are low (5% on average) but better than the interest on your savings account. When you’re ready to withdraw your money, it’s in your account within a few days. Acorns costs $1 a month if you have less than $5,000 invested, or 0.25% a year for larger accounts. If you’re a student or under 24 years old, though, you can use it for free! If you’re lucky enough to get retirement benefits from your employer, make sure to take full advantage. Pre-tax contributions to a 401(k) or 403(b) are great because not paying taxes at the time of deposit means you’re getting more from your earnings. For example, if you contribute $500 gross into a 401(k), you’re depositing the full $500, whereas on your regular paycheck, you’d take home $425 or less, depending on your tax bracket. Most employers that offer a 401(k) option will also offer some sort of match, meaning for every dollar you put in, the company will contribute, too. I’m lucky to get a 2-to-1 match up to 4.5%, which means if I contribute 4.5% of my salary each month, the company will put in 9%. That’s a huge amount of money on top of my salary! While my company’s match is at the high end, look at what your employer offers. Some companies won’t start matching contributions until you’ve been working there for six months or a year, but make sure to set aside your part of the match as soon as possible. If you get used to living on your full salary, it’ll be harder to tweak your budget later, when the match kicks in. Open a savings account that is separate from your checking account — maybe even at a different bank. Why? One of the hardest parts of saving is not touching your money after you’ve saved it. If you can easily see your savings account balance and transfer it to your checking account, you’ll be more likely to do so when you find something you want to spend it on. I recommend a savings account with an online bank like Ally, Synchrony or Capital One. They make it easy to bank online and set up automatic transfers. Start with a small amount that won’t affect your cash flow much and set up transfers that match up with how you get paid. For example, if you get paid biweekly, set up an automatic transfer every other week. I automatically transfer $75 a week into my Ally savings account. 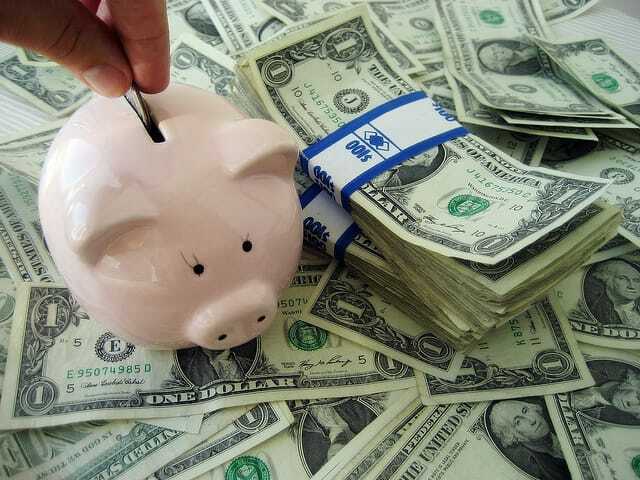 This way I save a good chunk of money without making a huge deposit from my monthly paycheck. You could also do it as often as $10 every few days. It would add up quickly, and it’s easy to make sure you always have at least $10 in your account. The best way to save money is to pretend you never had it in the first place. If your employer offers direct deposit, send a chunk of your paycheck to a savings account each time you get paid. Most companies will allow you to set up direct deposit to multiple accounts. This way, you never “see” that chunk of money, because it doesn’t come out of your checking account each month — it was never there in the first place. When I started my new job, I chose to deposit $100 from each check into my online savings account. Look at that money as “extra,” and budget for what you actually bring home into your checking account, rather than budgeting for your full income and then trying to squeeze out anything left over — because there might not be anything left. Your Turn: Do you use any of the strategies to save automatically? Do you have any other tips to share? David Wright is a 26-year-old father of two trying to save for the future, pay off the past and enjoy the present.